Thousands of runners took to the streets of San Jose for the Rock n' Roll half marathon and other long distance events (Oct. 1, 2016). 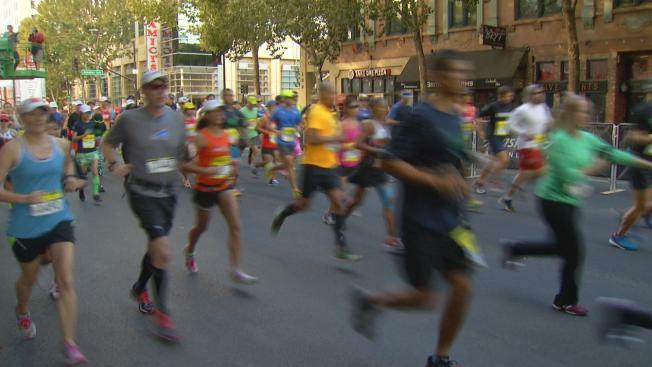 Stretches of pavement throughout San Jose were closed Sunday morning as thousands of runners took to the streets for a half-marathon and other long distance races. Various streets throughout downtown, Japantown, Rose Garden neighborhood and along The Alameda were shut down as runners dashed to the sounds of various bands rocking tunes along the race route during the Rock 'n' Roll Marathon Series events, according to event organizers. City streets are expected to reopen before noon, according to event organizers. The half-marathon and 10K race began at 8 a.m. and wrapped up with a concert performed by "Rogue Wave" at Plaza de Cesar Chavez in downtown, according to the series website. The Rock 'n' Roll Marathon Series, which kicked off in 1998, now holds races in more than 30 cities across the country. Prestigious names in music such Macklemore & Ryan Lewis, Brad Paisley and Train are just some artists that have performed in the past during this running tour, according to the series website.